Noise and noise reduction affects quality at higher ISOs. 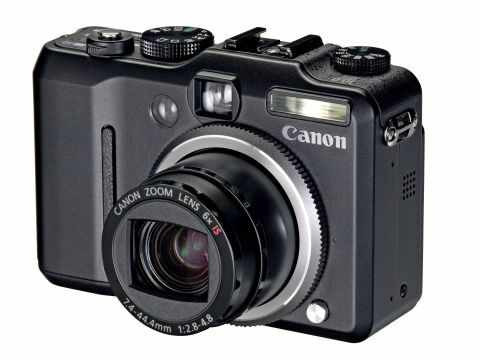 The PowerShot G7 is the latest in the G series cameras. These are Canon's flagship compacts, made for serious amateur photographers or SLR owners looking for a second, pocketable compact. It replaces the 7.1-megapixel G6, an altogether bulkier and more ungainly looking model. The G7, by contrast, has a top-class black finish and a much neater rectangular shape. It's not small, but when the lens is retracted, it'll slip easily into a jacket pocket. It still boasts a 6x zoom lens (the G6 had a 4x zoom) and, for the first time in a G series camera, it has an optical image stabiliser. You can fit optional wide-angle or telephoto converters by taking off the adaptor ring around the lens and there's a hotshoe for attaching Canon Speedlite flashguns. Canon's been busy on the inside of this camera too. The G7 uses its new DIGIC III processing system, which speeds up image processing - handy, with those big, 10MP files - and incorporates an advanced noise-reduction system that allows ISOs up to 1600 (and even ISO 3200 in one of its scene modes). Face Detection AF seems to be all the rage at the moment, and the G7 can detect up to nine faces in a frame and set the focus and exposure accordingly. And if you want to shoot movies as well as stills, you'll be impressed by the 1024x768 Movie mode - that's much higher than average. You get a frame rate of only 15fps at this resolution, though, and you'll need to drop to 640x480 pixels to get a smooth 30fps. For all its remarkable features and innovations, though, the G7 is missing a couple of things that keen photographers might have on their shopping lists. First, it lacks a wide-angle zoom - the 35mm equivalent widest setting isn't really that wide. Second, it doesn't have a RAW mode, something that has been standard on previous G series cameras. The shooting settings are displayed on the 2.5- inch LCD at the rear, which has a wide viewing angle and is very crisp and bright. Adjustments are made using the novel three-tiered multi-controller, also to the rear of the camera. In the centre of this is a Func/Set button and around it are conventional four-way navigation/ shortcut buttons. But around this is a third concentric 'tier', a spinning control wheel similar to those found on more advanced EOS digital SLRs. It all works exactly as it should, but it's on too small a scale. You can't always 'feel' your way to the right part of the controller and you often have to look to see what you're doing. The spinning control wheel doesn't have quite enough 'grip' for your thumb, and the faster you spin it, the more disconnected it seems to be from the changing figures on the display. The G7 can confuse you in other respects too. When you press the Func button to choose white balance, image size, image quality and other common shooting sessions, you have to press the Func button again to dismiss the on-screen menu. When you use the EV compensation button to display the compensation scale, you have to press the same button again to dismiss it. And this process is repeated with the Menu button. If you forget what you pressed to get where you are, you end up compounding the problem, pressing the wrong buttons to try to get back. Even at the lowest sensitivity (ISO 80), it's possible to see some noise mottling in blue skies, for example - and, in finely textured areas like distant vegetation, traces of the smudging and smearing that are characteristic of in-camera noise reduction. By ISO 400, the noise is clearly visible in A4 prints, and so is the smudging effect of the noise reduction. At ISO 800, the picture quality is plummeting, and the desaturated blizzard you get at ISO 1600 is way beyond a joke. Frankly, you've got to admire Canon's audacity at including these high ISOs at all, and we levelled a similar criticism at Panasonic's 10-megapixel LX2 (reviewed in issue 54). This noise/smudging issue dominates any analysis of image quality. For what it's worth, the exposure system is generally excellent, though the dynamic range appears somewhat limited. Colour is excellent, but the auto white balance doesn't do much to counter the cool tones of overcast days. All this does need to be put into perspective. Looking at any 10-megapixel file at 100 per cent magnification on-screen is misleading - it's what the prints look like that counts. At A4, the G7's prints look great up to ISO 400 and deteriorate after that, which will probably be acceptable to most people. One way or another, the G7 probably does produce the best quality you're likely to get from a compact camera with a 1/1.8-inch sensor. But its 10 million pixels don't do it any favours - it would have been interesting to see how this camera would have performed with the older 7-megapixel sensor from the G6.